1. Where Oguz started when he joined Sam’s first ever program. 2. How Oguz overcame his first operational challenge in his business. 3. Oguz’s next steps forward after he started landing handfuls of clients. 4. How Oguz discovered a new segment of his niche that he could scale into. 5. Oguz’s big picture vision for his company. 6. The most transformative part of going through Consulting.com’s training programs for Oguz. Dig deeper into your customer’s mindset. Sam Ovens:	Hey everyone, Sam Ovens here, and today I have Oguz Konar on with us. Oguz has been a customer of mine for quite a long time. Do you remember when you bought your first ever program from me? Oguz Konar:	Yeah, it might be your first product, honestly. You had a four series video sequence that was teaching about how to do lump email, and how to [crosstalk 00:00:23]. Sam Ovens:	Was it called Cashflow Consulting, or the Consulting Blueprint? Oguz Konar:	I think so ... No, it was before Consulting Blueprint. Sam Ovens:	Yes, that was just after I moved from the drop box folder. Oguz Konar:	Really? Sam Ovens:	That's when I didn't have a name for it. It was called Consulting Course or something, and it was a drop box folder. Then, that was the first 12 people, and then I was like, all right, let's turn this into something with a proper name, and a log in, and that was Cashflow. That's cool, so you, that would have been back in, what was that, like 2014 or something? Oguz Konar:	Either at the end of '14 or beginning of '15. Something like that along those lines. Sam Ovens:	Oguz joined my first ever program a long time ago, and back then he was selling SEO packages for about 250 bucks per month, and he was also selling websites done for you, for about $950, like one off. Back then he was, you were making around $5000 per month, right? Oguz Konar:	Yeah. Sam Ovens:	Didn't really have a niche focus, weren't, you were mostly selling the thing, instead of selling the thing as a means to achieve a goal. Do you know what I mean? Oguz Konar:	Right. Sam Ovens:	Which, is the big realization a lot people have in the digital marketing business, and in the done for you business. Then, through the program you were able to find a niche, and you chose merchant cash advice. No, merchant cash advance- Oguz Konar:	Advance. Sam Ovens:	... Services. Oguz Konar:	Yep. Sam Ovens:	We're gonna talk about what those are in a minute. You focused in on that niche, and started helping them get clients with digital marketing. Once you got the focus you were able to scale it up to, what did we say, about 50 thousand per month at moment. Oguz Konar:	Yeah. Sam Ovens:	Around 50 grand per month done for you, and now Oguz has made the transition from the done for you space into the training program space. Now, Oguz has a program that helps every day people become a merchant cash advance seller or service. His program shows them exactly step-by-step how to do that, and you're making around, was it 30 thousand a month with the program? Oguz Konar:	Correct, yes it's brand new. It's been three months. Sam Ovens:	Awesome, so there's gonna be a lot of good stuff in this interview for those watching. Because, you've been through the whole evolution of a consultant curve, you know what I mean? Back from the done for you generalist stage, with low prices, and through to picking a niche, still in done for you, mastering that, scaling it up, and then making the transition over to the programs. Let's dive right into back where you were when you first joined my program, Cashflow Consulting. What was going on back then? Oguz Konar:	I had a full-time job. I was an outside sales person, 100% on commission. I actually had two jobs to be able to make money. I used to work at the restaurants like weekend shift, because you make good cash money at restaurants. Then, since my job was to sell to small businesses, I had pretty tight interaction with the small business community. Then, I constantly, that was a time that websites were becoming more famous, and people wanted to have a website. They wanted to optimize, and all that, and I paid attention to that one. I was doing some research, and I found, I think, YouTube channel, or YouTube video that talks about how to sell people website design, and how it sorts the process to India, or some other country, and can make a profit in between. I started talking to people I was really close to, and someone said, "Yeah, let's do it," and I had no idea what I was selling honestly, so I didn't have any marketing background. I found a company in India who would charge me $300 for a website, and I was marking up to $950. Then [inaudible 00:04:25] process, by the way. We would think it would take a week to two weeks, and then it would end up being a six week project, and the people that you're dealing with, really low budget business owners, and they want to split 950 to three payments, and the last payment is always late. Things like that. Then, I noticed that they also wanted to bring traffic to it, then I learned about SEO. I found a company who would do SEO for me for $100 a month, and I marked it up. In my mind, I was making 250% profit, to $250 per month. I'm like this is pretty cool. If I can only get 5000 clients, I'll be rich. I was doing that on the side, without really knowing what I'm doing, and I didn't know anything about niching down. That somehow, you appeared on my newsfeed, and you were talking about the exact strategies to bring clients on. I remember I saved your video, and I showed it to my wife. I said, "This dude knows what he's talking about. He's talking about the problem that I have." I don't have a system to bring in clients, and I can't really be taking on four or five website deals, because it's just taking forever without making enough money. Then, your idea of lump emails, just was mind boggling to me at the point, and just sending video recordings. That's the point that I jumped in, and things started shifting from that point on. Sam Ovens:	I was running Facebook ads back then. Oguz Konar:	Yeah, that's the only way I would have known about you. My wife, I remember she made a comment. She was like, "Yeah, but he's not from US, how would he know the market here?" Sam Ovens:	That is funny. I forget how long I've been using those things for sometimes, and they work, man. That was way back then, when I barely knew how to use them, and I don't think they had any conversion pixel objective, not even joking. It was pretty unsophisticated back then, but it was cheap. You saw that ad, you saw the video, it struck a nerve with you, because I talked about needing a predictable system to get clients. You were basically pulling a rabbit out the hat each day. Oguz Konar:	That's it, yeah. I didn't even know where it was gonna go until you confirmed my belief that, hey, you can outsource the work without really 100% knowing how to design a website, or how to do an SEO. I said, ah-ha, so this actually can work. I can make that happen. That's when I noticed that it is possible. I remember it was right after I joined the program and you were teaching the strategy, the template you provide on how to record a video, and analyze somebody's website, and sell them the monthly package. I was going to a lot of networking events at the time, and I came back, and I had a bunch of, a pile of business cards. That's what you do at a networking event, you just collect business cards. To each one of them, I just went through their website or recording, and emailed them saying that, "Hey, we met last night. I hope all is well. I just wanted to send you some free information. This is my now server website," and ended up closing three deals at once. That was like, I was like, whoa, how did this happen? This is a totally cold audience that I met people from last night. Otherwise, my idea of prospecting was, make a list of all the people that you know that you have at least some kind of relationship with them. Go warm it up, get into the conversation, try it a couple of times, then open I up. That was my strategy, so called. But, the call to push totally worked, and I increased my fee to $1500, because you were talking about that at the front, the $1500 management fee for the website. That was the first time I noticed that, hey, I can actually scale this. But, of course, when I got the three clients, I had the operations problem, so I couldn't get clients for another two months. Sam Ovens:	That's the thing that ruins the dream of the billion dollar done for you empire, you know what I mean? As soon as you get a few clients you're like, "Oh, man I'm screwed." Just one thing real quick, can you move into the center of the frame. Just because, it splits the screen for the interview, and your head was real close to the edge. Oguz Konar:	Is it better? Sam Ovens:	Yeah, that's perfect. You did these website audits, and you would send them to these people who you'd met. Then, that started working well, and then you started increasing your prices. You're charging $1500 a month management fee. You got to three clients, and then the internal operations broke, which is totally normal, by the way. Company operations break at every different stage, and you've got to constantly figure out, right, how do we restructure and make this thing efficient at this new level. What happened for you next? Oguz Konar:	I thought I needed to hire someone, because I was not at the point to quit my job, which was paying me really well at the point, but I just didn't want to have a job. I hired my first virtual assistant from Indonesia. She started working with me part-time, and I was just throwing stuff at her, like the stuff that I wouldn't be able to do. It's gotten to the point that I would only take calls for the meetings itself, and you followup any client management, she would be handling that. Then, we hit that level, and it just got all screwed up when we added more clients. Because, at that point we had clients on the recurring revenue, they needed reporting. We didn't know how to send reports to them. Honestly, I would just pull data from Google Analytics and Google AdWords, and that kind of thing. We didn't know there was software to use for that. I tried to hire, I went through three more hires, and it didn't work out. We'd fired them, so then we went back to basics. Through that process we lost a bunch of clients, so start from scratch. That was literally a rollercoaster. It was really unpredictable. One month we would hit $10000, and two months later we're back $3000 a month. That was a cycle. At that point, I figured out how to get clients. But, I just had difficulty figuring how to service them. Also, every client came with its own challenges, since you don't know every industry you take on pretty much, and they expect you to have a basic understanding. I remember I would look up certain businesses online to understand what the heck they do before I'd jump on the strategy call. Then, I would ask them questions to close them. That went on for a while, until we hired a bunch more people, and then we started having a solid structure, and more of a predictable income at that level. Sam Ovens:	I remember those days, it's really hard to do done for you for all these different types of businesses, in all of these different types of spaces. Because it takes you, you've got to learn the ins and outs of the entire thing. What's the niche? What problem do they have, and then how does this service or product that this client's selling related to that problem? How is better and differentiated from the other people providing stuff to them? Then, what are the margins, how does it sell, how much is left to use for ads or whatever? It's quite complicated to figure all of that stuff out. That's why picking a niche just takes all of that off of you. Because, every new person you speak to is just the same. Oguz Konar:	Right, and I tried it three times at that point, because I know even then you were talking about picking an area and focusing on it. At first, I picked lawyers. I hated working with them. I never understood their mentality. They want people to come to them, they don't want to sell them, only generate a ton of lead for them. Then I said, "Oh, screw that. Let me move onto something else," and I tried medical. Because, I used to sell to medical facilities, so I tried to do some dental marketing. It didn't work, prospecting was a headache to get people on the phone. Doctors are super busy, and you got to do strategy sessions, and I didn't like that one. Then, through this churn, pretty much, at some point we had clients from 27 different industries. It was just, I pulled the record for the entire year, and all the clients we went through. We were just bringing them from one end, and then we're losing from the other end after two, three months. Just so many of them. I think, at that point I joined your mastermind, and you put a lot more emphasis on niching down. At that point, I'd round up, I don't remember the exact year, but we ended up, by just luck, at merchant cash advance company as a client. Through that process I'd changed jobs, and I was still in sales, but I was a door-to-door salesperson selling credit card processing, and merchant cash advance to small businesses. We landed this client and they're talking about their problems. For the first time, I felt like I was understanding what they were going through. Because, I was the one selling it before, I understood the operations. Then, we started doing marketing for them. Well, then the first month we generated about, I think, $98 thousand in commission with our marketing. That was the first point that our marketing generated that much revenue. We never had a problem generating leads. But, it was always the confrontation with the customer, "Oh, leads are bad," or, "We didn't close them. You didn't send it to me, we didn't get it," type of thing. But, this company just clicked, and they brought me into their board meeting, and I was analyzing their sales process, and making comments. They hired us to handle more of their marketing. Soon enough, that client became our biggest client. At some point their ad spend was about $75 thousand per month. We were charging a management fee of $15 thousand, and handling their email marketing. That's when I noticed that I found my niche, and I would focus on that, and restructure the entire company based on that. Sam Ovens:	Got it, so this is interesting. Because, I want to, because you said you tried picking some different niches before you got this one. For people listening, that's why you shouldn't worry too much about what you choose for your first niche, because most of the time people get it wrong, and that's fine. I found my niche by choosing seven wrong ones. You found your right niche by picking, must have been at least three or four, right? You chose lawyers [crosstalk 00:14:50]. Oguz Konar:	Spending a lot of money in between, like have specific websites built, to prospecting tools, even print materials. I remember spending $5000 for specific catalogs, because I wanted to mail it out to dentists. I wrote two books actually, specific to the industry, to make a name for that. I tried all of it. I'm like, "Oh, this doesn't work. I'm done." Because, I wasn't, now I notice that it was not working, because I was not feeling passionate about what they really do. I just wanted to make money. I just wanted to make clients. That was on my end. Sam Ovens:	That's exactly it, and you obviously have some sort of affinity to this niche. That's what I've noticed from doing a lot of these things. Because, I can now see the pattern of how it happens. There's always something that makes you tied to this niche, even before you discover it, you might have had some interest in it. Have you noticed anything perviously where you were interested in the merchant advance space in any way? Oguz Konar:	Back in the day, so in college, I got accepted to college if you go back, that's the first point I noticed that I was interested in finance industry. I didn't know what I was gonna do. I didn't know what I was gonna major in. I had no idea what I was gonna do with myself, pretty much. My family wanted me to be a doctor, or somebody in the healthcare industry. I chose the major biology. Then, biology was okay, then I wanted to do double major. I added chemistry, so I graduated with a degree in biology and chemistry double major, from a state university. Everyone thought that I was gonna go to medical school, and I stopped all of that, and start selling sunglasses and bags in flea markets. I borrowed $300 from my mom, and to this day they still remember they were super shocked, because I was this bright student graduated from college. Everyone was expecting for me to go further my education, and then I started selling on the street. Then, now I've talked to a lot of people, one thing that would grab my attention, I would admire, are the people who work from office selling financial services like stocks and all that. I just didn't understand how it was. I was a little fascinated by that. That was the first, my first exposure to finances, and selling, and the whole industry. The second one is, way after that when I was selling on the street, I was selling credit card processing. Having businesses accept credit cards through my system, provide the machine put it up, have them swipe it. The way it works with that industry is, you don't really make a lot of upfront money, it's more like residual. From each client you set up, you're making 50, 60, $70, which is okay. Then, someone introduced me to merchant cash advance. They said, "Well, you're working with businesses all the time, and some of them will go through a financial hardship. Why don't you offer them just alternative lending?" I said, "No, problem." They gave me a one pager. I was talking to my clients, and I offered someone, they took that. They took out a $40 thousand loan, and about five days later I receive my first check from the merchant cash advance company. It was for $4500. That was the biggest commission check I ever made, and that was easy sell. That was the moment I said, screw the credit card processing. I'm fighting for $50 a month. Even if I keep that client for two years, that's still, what, I don't know, 12, $1300, and I'm gonna fight to keep that customers. This customer, there's no customer service, and I just made $4500, that's crazy. I started selling more of that, and when I jumped to the marketing side, when I was helping these guys, I couldn't add two and two at that point. But, then I noticed why I like it so much, because I like making money, and I also like giving some businesses opportunities to get lending. When we were doing the marketing, it just all added up, and I felt really good about helping them. Because, I knew the outcome they were gonna get. If this worked, I knew how much they were gonna make, what kind of difference it would make for their business, and how easy it would be if they only knew how to do it properly. Sam Ovens:	Got it. You have, since childhood, an interest in finance, and this kind of in financial service. That makes sense, so you've got some sort of passion about it. But, more than that, you had sold this thing door-to-door. You could imagine yourself back then, if you could just stay at home and call warm leads that got delivered to you, which would have been a serious weapon. You know what I mean? Oguz Konar:	Yeah. Sam Ovens:	Because, you've been there doing the hard stuff. You probably think, imagine if I could just get the leads, and then just dial. You'd crush it. In a way, you're scratching your itch for everyone who is in the position that you were in back then. Do you know what I mean? Oguz Konar:	Correct. I didn't know how to name it properly back then, but it's through working really hard on the streets. I would put in 60, 70 hours a week. I had an old beat up car, the heat would not work in winter. The AC would not work in summer. You're just in blistering hot, and you have to make calls. I have developed the dream of working from home. I said, I will not do this forever, this is just so painful. This is really hard to make money this way. When I quit my job and took on consulting, owning my marketing company full-time, I was making $175 thousand a year from sales, so I was in a really good position in New York City selling very comfortably. I got used to being on the street, but that burning desire to work from home, and manage my own company, and not have to walk door-by-door, and get rejections all day long, it just built up so much fire that it didn't really matter at that point. Quit that, and transitioned into running my company. Sam Ovens:	There's just so much waste, right? Oguz Konar:	It's so much. Sam Ovens:	I remember doing stuff like that back then, driving my car around trying to get different meetings with different people, and then just getting rejected. I looked at it after a week, and I was like, most of my time was spent doing nothing. Oguz Konar:	Yeah, and it's just crazy. Sometimes, for example, in one of the jobs that I had, I was focusing on gas stations, because they accept a lot of credit cards. My boss would tell me, you got to call them before you show up, so you know the owner is there. When you call them, even if the owner is there, if they know you're a sales person, they just tell you, he's not here, he's out. You have to drive down there to see if you can catch him for a two minute conversation. You drive half an hour, show up, and the owner would have left 15 minutes ago. Then, you drive back to another appointment, play all these stupid tricks just to be able to talk to someone, who's probably not interested in speaking with you. You're interrupting their day, you're trying to convince them about a product they already have. You're just telling them you can save them money. It's just the whole mindset and the way it makes you feel, I don't think it's healthy for anyone. Sam Ovens:	Yeah, because you've always got, I always had in my mind, if what I'm really selling is actually helpful, then it shouldn't be this hard. They should just be wanting to buy this thing, because it's gonna help them for God's Sake. Why do we have to do all this other stuff? Oguz Konar:	Yeah. Sam Ovens:	Then, you picked this niche, and then tell me how things changed for you in the done for you business when you picked the niche. Oguz Konar:	One thing I noticed is, after I picked the niche, and we targeted merchant cash advance companies, a lot of them are in New York City. We would call them, I hired someone to do telemarketing. I actually opened an office in Columbia, and flew out there, trained three people on telemarketing, so they would be on the phone all day calling these people to talk about the services, and they were booking a bunch of appointments for me. I would have three to five appointments per day going through them, and I would come across the same problem over, and over, and over again. They had the mindset of purchasing leads, not investing into a system, creating an inbound lead generation system. They're just so used to paying 20, 30, $40 for someone to qualify a lead on the phone, they would just close it. What I was talking to them was brand new, and it didn't make sense for them to pay a monthly recurring revenue. Their thought process was very small, and that's why they needed to constantly hire more and more people on the floor to keep up with the volume of the phone calls they had to do. It's gotten to a point that after going through so many calls, I got really pissed. I got in front of the camera, and I did a YouTube video. It's like 17 or 18 minutes. I had a little whiteboard here, and I drew what inbound marketing is all about. I said, "Most of you guys are here, you're buying leads, which is the weakest point. Because, you pay, you get the lead, then that same lead is sold across the entire industry 10 times. You're begging people to buy from you. You want to be here, inbound marketing, people come to you, and they buy from you." I was really aggravated, and I put that video online, and something happened. People started finding it, and they were really impressed how transparent everything was, and all of a sudden we started getting better quality leads from more established companies. Because, it touched a pain point for those who'd been in the industry for a while, have been spending 10, 15, 20 thousand every month buying leads, and there was really no one who was doing inbound marketing for them, from the conversions from the website, SEO, online marketing. Then, we start having people come to us. Then, I fired everyone from Columbia office, closed it down. Then, we started investing more time [inaudible 00:24:26] marketing on YouTube channel. Because, it's very specific industry. Those who are in the industry, if they do a Google search, they find out about you. That's what I discovered. The quality of the strategy sessions change quite a bit. It wasn't like we were pushing for them to jump on the call with me. Because, I remember at the time, I would try to apply your script, and the difference was day and night. If we were getting leads by telemarketing, it wouldn't make sense for me to ask the question, well, why are we on the call today? They're like, "Well, you just called me. You've been calling me all day long, that's why we're on the call." Whereas, if they reach out to us, it was a whole different story. It allows me to have them open up and tell me the entire story. I liked that approach, and we started doing more and more of that, and we started building a portfolio of these clients. With that, came case studies, client success stories, client testimonials on our website, and soon we became the company, I think we're to this day, the only company that does inbound marketing in this industry. Sam Ovens:	Got it, and then you had the fly wheel effect really. Because, once you pick a niche, you get a client, you get them results, you get their testimonial. That helps you get more clients, there's more testimonials, helps you get more clients, more testimonials, and then it just starts going voom, voom, voom, voom, and then you're up, yeah. That's the beauty of picking a niche, because it has that effect. What next, what happened after you started getting more clients, more clients, more clients? Oguz Konar:	Well, another set of internal organizational problems with the growth. At some point we grew up to 12 people. It was just a nightmare to manage from home, and I was resisting to move into an office at that point. I just didn't want to do it. I didn't want to go that route, that was never my dream. We said, "Well, we got to do something about it," because that was effecting our management of the clients properly. Then, the other thing we noticed as we became more popular on the search engines and YouTube, there were a ton of people who were not in the business, but they wanted to be in the business. Because, to be a merchant cash advance company, or alternative lending company, you really do not need to be licensed, or need to have a degree or anything like that. You don't need an office, and no overhead. You can call yourself Sam Ovens Merchant Cash Advance tomorrow, and no one would argue about that. Because, you're not giving your money, you're pretty much selling the product, and finding lenders for that, and have them fund your client, right? We had a flood of people who would come to our website, and I had my calendar link, and they would book phone calls, and waste my time, just picking my brain pretty much, and they have no money to pay for our services. Because, at that point we're charging 4 to $5000 as a starting fee, plus a set up fee of 3, $4000, because they're usually missing a landing page, some kind of optimization on their website. Then, it's gotten a point that I would have a full calendar for the whole week, like four or five meetings a day. Half of them would be a waste of time. Because, they're not in the business. Maybe they have small landing page, zero clients. I got tired of telling people, "Listen, we can't really help you." What I noticed, is the people that I turned down, after a couple of months, five or six months, they would go out of business. It's not because we said no, it's because they don't really understand the product. I started asking, I was seeing them as a waste of time. But, I started asking them better questions. I said, "How did you hear about the industry? Where are you getting your training from? How are you learning about this product? What are you doing to close more sales?" Things like that, and I noticed that they didn't have any place to learn the product from. The place they were getting their information from were the lenders who provide the money, and lenders kind of lock you in. They provide free training, but they ask you to exclusively send your deals through them. Then, if you learn about the product, then you're stuck with that lender who pays you one third of the commission you could be making. I noticed that there's no comprehensive platform to train these people to become successful merchant cash advance business owners. I remember what you said. I don't know if it was in the Mastermind, or some other products, said, "Don't build a product. Sell it first, then build it." Then, I started testing, experimenting with these appointments. I would tell them, "Listen, if I had a service where you would be able to go in and learn about the business inside out, how to sell it, how to close it, how to build a website landing page, would you have interest in?" I had a waiting list of about 25 people who wanted to jump in, and I had no idea how I was gonna price it. I did the first version of product, and I blasted an email, I think, that was three months ago. Our email list size was about 350 people who opted in to receive information about this product. We generated 25 sales within three days. People just bought it for 897. Then, I started a Facebook group. I started creating more content, and I noticed that, and I honestly, the reason I upgraded to Uplevel was that, I was getting stuck. Because, we were jumping from 50 thousand, to 80 thousand point back and forth, because we were stuck operationally again. The clients we were targeting, the merchant cash advance companies, they were having lead quality problems, they didn't want us to take long, we didn't want to put them under contract, things like that. Then, I remember, one of your trainings, you said, "You know what, you have to create a product, productize what you're offering." That was my transition. I said, "All right, so I'm on the right route here, so let me just learn more about it," and blasted that product out. All right, now, obviously it's much more profitable than done for you. It is a lot less headache, because I'm literally jumping on a call once a week with these members, and answering their questions. Since I sold the product before, the majority of the problem that they're having is closing the sale. We're going through that transitional phase right now, is where we are in our business. Sam Ovens:	Got it, so this is good here. You wanted to make, you didn't start thinking about really making a switch from done for you to programs- Oguz Konar:	No. Sam Ovens:	... Until you just really maxed out done for you. Oguz Konar:	Correct, because we have two options, either I would need to hire more people for spend more time on the client management, and implement newer strategies, because people were asking us more about the Facebook Messenger, and different marketing tools that this comes out new. People need to be up to date with that, and people ask us to get into email marketing. Our existing clients needs were, they wanted us to become the marketing department for them, not just the lead generation. The problem with that model is, that puts a lot more weight on you on the results, not on the [crosstalk 00:31:19]. Sam Ovens:	That's impossible, man. You can't give more clients more staff, and then start doing more things. Because, everyone unit of more in every one of those different things, adds exponentially more complexity. Exponential more complexity, do you know what I mean? You can't do that, that would blow up. Just doing the one thing, and adding more staff, and taking on more clients, to balance that is a serious feat. But, adding new parts, no way. That's good, because that's the pain point that everyone has in the done for you business. Lots of people ask me, "Sam, why did you stop selling the agency stuff? Why do you now sell courses?" It's like, dude, get to that point with done for you, and then you will know why. You won't even have to ask me the question. You'll be crying, do you know what I mean? It gets to a point where it can't go any further. Then, it's just a natural progression to go to the programs. Oguz Konar:	Right. Sam Ovens:	Then, so you thought about making the transition, and then you'd already seen some clues, because you'd been on some calls, and these people were trying to pick your brain about how to start it, how to run it, and they didn't have the money to pay you for the done for you. You noticed a new segment of the market emerging. Once you mastered doing it for the people who are in business, the people who want to be in business start wanting to learn from you. Then, that opens itself up, and you never saw this here. That's the interesting piece, is that this market here is always bigger. It's huge, because it's people who want to get into the business, which is massive. But, you never saw them at the beginning, because they don't have established business websites. Like, they're not in the directories, you know what I mean? It's always funny how it happens. It happens the same way every time. But, you never can see it, until you do each piece, and then they kind of .... It's like climbing to the top of one mountain, and then there's the mountain behind it appears. Do you know what I mean? Once you really saw that, you thought, well, I could help these people. How would you explain their problem? Oguz Konar:	I was totally, it's gotten to a point that I was ignoring them. Because, to me, in my mind it's not a good fit. They can't pay for my services. Also, I think it's an ego thing. It felt good to be charging 4 or $5000, and not deal with people. Be in that position to be telling people, "You can't afford us." But, I noticed that it was just like you said. There were a lot less existing merchant cash advance companies, and they've been in business for a long time. They're really demanding, they wanted more and more services from us. Now, on this side, people are begging for information, and there's no one providing it to them. But, I didn't even notice it, silly old me, until someone pointed out. I was on one of the calls, and the guy is like, "Hey, man, no we can't hire you. Me and my partner were really hoping we're gonna start business, but can you coach us? Do you have something that we can read, or we can get our hands on, or we can pay you so you can show up to a phone call with us once a week?" I said, "No, I don't have anything like that, so do you think that would beneficial to you?" They're like, "Yeah, this has been 45 minutes, and [inaudible 00:34:28]." That clicked, and I remember talking to one of my colleagues and I said, "Guy, what do you think about this? Do you think we have something here?" The main objection was, "Well, they don't have money. You're gonna teach them something, and they're gonna fail then." I said, "What if we teach them everything we know, we open it up?" They resisted the idea, because it took a while for us to figure out the Facebook ads, the organic approach, and one employee was like, "No way, you paid so much to learn that stuff, probably a couple hundred thousand dollars. Why would you just give it away for $900?" I said, "That's okay, we'll just give it a try and see what happens." Then, we started offering it. That was the turning point, just like you said, until then I was totally ignoring that segment of the market. Because, I was so focused. It was also, another thing that happened at the same time, we wanted to comply with the demands of one of our biggest clients, and they wanted us to do pretty much anything and everything. We said, "Fine, but the bill is gonna be $20 thousand for us, our management fee, not including the ad spend, plus the 50 thousand ad spend." We've been working with them, and they noticed that after six months of working with us, they did not close deals that much. The sales person reporting the numbers wrong to the CEO, so he was reporting back to us that every month the head of department for sales, and what is the actual numbers the sales they close was much lower and they ended up parting ways with us. All of a sudden we had a $20 thousand cut in our revenue that we couldn't control, that we didn't even see it coming, because everything looked so good based on reports they gave us. Because, we don't really know what happens once we send the lead over. That's their job, and they're telling me, "Everything's great. You guys are awesome," then next month they're out. That was just so painful, building the company that level, and you think that you have it covered. They're really demanding you do everything, they disappear, now you're left with the staff that you hired just for them, and the loss of the revenue. That's the point that I, instead of trying to jump in and find bigger customers like that, I want to take one week off, which was before ... My wife was almost nine months pregnant, within a week she can go into labor. I said, "If she goes into labor, this is our second baby, I'm not gonna have a chance to sit down and create this product." For a whole week, I blocked my calendar out, didn't take any appointments, no team meetings. Just had the first version of the product, put it together, and put it on the market. That's when we had 25 sales up front through that. That's how we, finally, I saw what the market was demanding, instead of what I'm assuming about them. Sam Ovens:	Got it. Then, really what things were they struggling with the most? Because, were they already in business, or were they thinking about it getting into the business? Most of that newer market that emerged? Oguz Konar:	Our best students right now, are the ones who just got into the business, and they're stuck. Sam Ovens:	Got it. Oguz Konar:	Since there's no formal training, they go buy leads. They spend $1000 or so, buy leads, and find out that it's really competitive. Everyone else is buying these leads, and they have their own perception about the industry. We found a common theme. They would come onto the phone, and they say, "Hey, as we know this market is super competitive." I would stop the, "Whoa, why do you think it's competitive?" "Well, everyone knows about merchant cash advance." I'd be like, "No, there's like $80 billion unmet alternative lending out there, not many people know about this." They're like, "No, no, I called 200 people a day, this is what I hear." I'm like, "Where are you getting your information from?" "Well, we're buying these leads." That was their biggest problem. They really didn't know how to prospect, and how do you generate leads. They're all sales people, A type, they want to just close people hard. [crosstalk 00:38:19]. Sam Ovens:	That's interesting, so had they been selling merchant cash advance, and now they wanted to start their own merchant cash advance, was that [crosstalk 00:38:26]? Oguz Konar:	A lot of them. Sam Ovens:	A lot of them. Oguz Konar:	They seen the potential, because they were making good commissions. They said, why would my boss make half of that, I can just start my own. Sam Ovens:	Because, their boss wasn't even landing it anyway. Oguz Konar:	Exactly. Sam Ovens:	It's not, that would be a huge barrier to entry if the boss had a billion dollars of lending in his capital, or her capital. But, that wasn't the case. It wasn't their capital anyway. It's just a middle man going to them, so that makes total sense, and that actually a really good marketing message to all of those people. Hey, why are you selling stuff for this person, when they don't even own the money anyway. It's unnecessary. You can then do whatever you want. It's funny how a lot of financial services work like that, like insurance too. If you trace it back, the underwriter is like, there's only so many of them, and there isn't many of them. Oguz Konar:	No. Sam Ovens:	Then, there's all of these middlemen businesses. Oguz Konar:	Right. Sam Ovens:	That makes sense, and then because these guys are sales people, they know how to sell. Then, they start their own merchant cash advance business, which is pretty easy. But, then the hard part, which they never saw coming, was the marketing part. Oguz Konar:	Right. Sam Ovens:	Which, is the part that you had figured out. Oguz Konar:	Also, the sales part, Sam. Because, the type of sales they learn from their bosses, is pretty much, get on the phone 200 times a day, send emails, update your CRM, and just convince people, either they buy, or they die type of mentality. When they come in, we have an unlearning process for them. I tell them, this is not how you're gonna sell. This is gonna be a consultative type of selling, because what if they're not a good fit for merchant cash advance, and the response is, well then, they're not a good fit. There are so many other parallel products that goes into, if it is not a good fit for that, it could be a fit for something else. We teach about those different products as well, so for those who come in, it's like a culture shock for them. Because, they all come in saying that, "I know how to sell." Like, "No, you don't. You got to go through this training first." Sam Ovens:	That's funny that, that's an old era. I swear, back not too many years ago, like 10, 20 years ago, that's literally how everyone sold. They just called people, and harassed them. It's like the Wolf of Wall Street sort of thing. You know what I mean? That isn't, that's a bad way to sell these days. You know what I mean? Oguz Konar:	Yeah. Sam Ovens:	The world's changed. Oguz Konar:	A lot of these models, Wold of Wall Street, because it's so relevant to them, stock market guy selling really hard on the phone. They keep making reference to that, and the first thing I tell them is, "You got to stop making reference to him. He shouldn't be your role model, first of all." Sam Ovens:	Yeah, unless you want to be in jail. It's not a good hero. Got it, so then you sold a couple of people into this before you built it. Then, you took a week to build it, and you were selling it to them for 900 bucks. What happened after that? Oguz Konar:	After that, the reason I joined they Uplevel is that we're doing all of this without any ad spend. This is just people coming to us, because they find us somehow online, right? Sam Ovens:	Well, tell me how that happens, because it doesn't just magically happen. Oguz Konar:	No, it doesn't. A lot of work went into it. I have about 20 videos that I created over time, very specific to the industry talking about the pain points. Initially [crosstalk 00:41:51]. Sam Ovens:	Give me an example of one of them. What's the name of one of them, and how is it specific to a pain point? Oguz Konar:	The one that has the most views right now is, Why do Most of the Merchant Cash Advance Companies Fail? That's a shock, because a lot of people sell the idea of how are you gonna be rich. I said, the total opposite. Most of you guys, I tell them, "Listen, 80% of the small businesses will fail, but from my experience, 95% of the merchant cash advance companies will fail within the first year. If you're starting out, bad news, you're gonna most likely fail. This is how you avoid that." That was the video that I was aggravated and I wanted to put it together. It started out with a really negative tone, and I built it up saying that this is how we avoid it. If you're gonna do this, you're gonna end up here where a lot of the people that you know right now will end up, and I gave examples. Then, I built upon that, because the people seemed to like that style, very straight forward, very direct. Then, I talk about why people fail at selling merchant cash advance. Four ways to generate 15, $20 thousand a month within 30 days of merchant cash advance, that was another one. Then, I started, I created I think it was a 49 minute video talking about the industry, totally free, and I'll I would do is ask them to opt in, and I didn't know what they would be opting into. Like they would opt to receive [crosstalk 00:43:10]. Sam Ovens:	These videos, the first ones you were talking about, like Why Merchant Cash Companies Fail, they're on YouTube and stuff, right? Oguz Konar:	They're on YouTube, yeah, yeah. Sam Ovens:	People are just searching all different terms, they stumble across these things, they like it because it's different, and very raw and honest. Then, how do, is there a link? Is there a call to action in that video where you tell them to go to another step? Oguz Konar:	Yeah, so I would tell at the end of the videos that, "Hey, there's a link below if you want to learn more about it, I have a free one hour training on this, where you can learn more about it, so I don't want to bore you with details right now if you ended up here by accident, so click below." They would click and go to the landing page, opt in, watch the one hour training, and at the end I make an offer. Sam Ovens:	Is that like a VSL video, like a slide presentation? Oguz Konar:	VSL, yeah. Sam Ovens:	Got it. Oguz Konar:	Yeah, prerecorded slide presentation. At the end they can buy straight up, or they can schedule a call with me. The reason I put that option in there, I just wanted to get feedback. I honestly did not know if they liked it or not. I didn't want to just offer, and wait for them to buy it. Some people bought it, some people booked a call. We still have it like that as of now. For example today, after our meeting, I have eight meetings I can show my calendar, from people who booked it through us. Then, we started throwing some money onto YouTube ads, to be able to show it to more people. Right now, I think we're spending about $500 a month. Nothing [inaudible 00:44:28] To get your help from Uplevel Consulting is, how to scale. Right now, we're averaging about a sale a day that comes either automatically or with me. I don't have any control over that, it's just a lot of SEO, a lot of long blogs, and I did many speaking gigs in the past, because I didn't know what I was doing. I just wanted to be an authority, so I did blog posts, I spoke at different events. People are finding my name, or my company's name somehow on the internet. But, the challenge with that as a business owner I don't control it. I can't predict if we're gonna have 50 sales 10 days from now, or is it gonna be 10 sales? It's good that we have them. That's why I wanted [inaudible 00:45:09] with Facebook, so we can control them, and also increase our prices, so we can serve more qualified people who really want the industry. Sam Ovens:	Got it. Cool, and so that's basically where we're at now, right? You've still got the agency business, which is in the same niche. It's just helping the established ones who can pay that, and you're doing like 50 to 60 grand a month there. Then, you're doing 30 on the program, and combined that's like 80K a month, that's pretty good. Oguz Konar:	80 to 90 fluctuation, yeah. Sam Ovens:	Then, now you're main focus is gonna be the program and scaling that up, and slowly letting go of the agency. Oguz Konar:	We already did that. We already let go of a couple of the headache clients. We're just holding on for the revenue. I had tough conversations with them, and that's my goal right now within the next 45 days. I'm not totally transitioned. We're gonna still hold onto some of our clients. But, do our best to get the revenue from the information product predictable, so we can through that [inaudible 00:46:21]. Sam Ovens:	What's your big vision, mission, goal with this thing? Where do you want to take it one year from now, and then five years from now? Oguz Konar:	Our big vision is to be the only, the most comprehensive company that provides training for those entire alternative lending space, not just merchant cash advance. This is a really big market, and one thing I already noticed, two of the largest companies in this industry approached to us to see if we can have some kind of training for them to have their employees go through. Because, there's a high turnover in this industry, and one of the problems with the owners, since it's 100% commission, their turnover is 40 to 60%. The biggest problem, operation problem for the owners is the training process. Bring someone in, usually these are recent college graduates, they're really high energy, high passion. They don't have a money, but they want to make a lot of money. They approach us, and I told them, our model currently doesn't work for that, because we're promoting them to be their own boss. We don't want to take somebody's employee and teach them how to be a boss, and so we can create another version of this if there is enough interest. There are so many other products that even some of the experienced merchant cash advance companies do not know about. My goal is to build a system, not just for the merchant cash advance, but for the entire alternative lending space. Either we can have people starting out, go through the program, haven their own business. I'll also serve larger clients and have their employees go through our training through a licensing model. They can buy a license per employee, have them go through, take certain tests, and pass it so that they qualify, so we take away that burden from the business owners. Sam Ovens:	Got it. Really, controlling the education and training, and being the standard for this whole industry. Oguz Konar:	Yeah. Since there is no certification required, we want to come up with some type of certification that they're certified they've passed through our training. So, they can have that, and it would make it easy for them to get a job if they're looking to play in that game. Or, if they're gonna be their own boss, then they go through platform where they know all about the alternative lending space. Sam Ovens:	Got it. What I would recommend with the certification thing, because I've thought about this too. I wouldn't do it. I would say you're certified once they're successful doing it. Because, you've got to be careful what you set the objective as. Do you know what I mean? Because, human beings optimize for the objective, and if you just look at university, or college, the objective is to pass the paper, and then to do that, you need to get so many points. Then, the students real smart, they just think, I don't even need to go to lectures, I don't need to do any of this, so I'll just learn these past exams, and then just get this many, and bang, done, right? They optimize to get the objective. That's not bad, that's smart. I used to think I was lazy back in university, but really I was just optimizing to get the goal with the least amount of effort, which is smart thinking. But, that's the distortion you create when you set the objective different than what it really should be, do you know what I mean? Oguz Konar:	So, you want to offer certification at the end of the training. You want to have them certified after they successfully build a company and reach or certain level? Sam Ovens:	Or, if it's, so yes. Like in our, in Consulting Accelerator, someone is successful, and I don't even like the word certified. We use the word successful, when they get a client, have their own business, and they're making some money, right? That is the first point of success. In Uplevel, it's like someone's successful when they transition from done for you to training, they build a program, and they get some clients that way, bam. When you make it that, and there's no other way to be successful other than do that, and there's no way to seek gratification, or award, or anything other than that, it forces everyone just to focus on that. Do you know what I mean? Oguz Konar:	Got you. Sam Ovens:	Even if it's training someone's employees, you still don't need, the certification can be once they're meeting their targets, or their quota for at least three months running. If they can prove they've hit whatever their company's quota is for three months running, prove it with documentation. Then, I would call them successful, or certified if you want to. But, you got to keep that thing on the right thing. Because, that's what's really rotten [crosstalk 00:50:58], made the whole education industry rotten. The whole thing is gonna collapse, because it got all convoluted. What are we trying to do here? Are we trying to get educated, or are we trying to actually solve problems for the world? Do you know what I mean? Oguz Konar:	That makes a lot of sense. Sam Ovens:	Going through the program, you've been through the whole, pretty much everything I've offered, apart from the drop box folder from back in 15, 2014 or '15, all the way through to now. You've gone from about five grand a month to about 80, 90K a month. Through that whole process, what would you say is the one most transformative thing you've learned from me in the programs? Oguz Konar:	I'm not gonna say find your passion, because it doesn't really apply to a lot of the cases. But, when you say, I don't think people really understand what it means to understand your customer. I know you keep repeating it, and I know you work on your clients all the time. But, one thing that changed everything for me, is when I really felt like not only I understood them, I wanted to understand their problems. Because, that's when you get into a deeper level of thinking about your client's problems, then just focusing on your monthly revenue. Because, through our Facebook feed, and everything else we go through, the books that we read, we're just asked to focus so much on how to grow the business, how to make more money, how to generate more revenue. We forget that revenue will role in once we really tap into an actual pain point of client, and offer an actual solution. Once they see that you're genuinely interested in helping them out, and you get results for them, then they know that they're not gonna be able to tell you, "Hey, I can go and get that service from someone else." At this point where we are, that never happens. Because, they know that they can either they want to do it, or they don't want to do it. But, they cannot find the excuse of saying, I can get it done cheaper. Because, that concept doesn't exist anymore. It took me a long time to figure it out. I was just so focused on revenue, money, I thought that's what a business owner does. Know your numbers. Saying things like that, of course, they are important in the context that they are in. But, overall, the biggest thing I learned from you, and watching you, and following you for many, many years is, that literally understanding what they go through every single day. I take a note here every single morning, what are they thinking right now, or literally feeling like you are in the same industry waking up with the same pains, and staying awake with the same pains, and how do you solve it? If you become the solution for that, things become, everything becomes more in tune with everything else you're doing. Things flow a lot easier, you're a lot less stressful. The agency model, I know people, that's a good model, but after you pass a certain point, it creates a lot of stress. Especially, if you're not niching down and focusing in one area. There's no way that you can be a specialist in 10 different industries. I know many people in the program they push to choose a niche, but it's okay to try a couple of them, because sometimes we don't know what we don't know. You might think that you enjoy working with a niche. My initial thought that I would enjoy working with dentists, because I sold to them. I thought, I had some kind of affiliation with them, and I understand them. It couldn't be further from the truth. I didn't understand anything about them. That's the reason I stayed away from medical school. I forgot that at one point I had an opportunity to go medical school, and maybe become a dentist, a doctor maybe. But, I stayed away from that, because I didn't want to be in that industry. For me to go back and try to service them, was a stupid idea but I didn't see that happening until I try it and kind of fail forward. I would say that, literally just focus on the problems of the customers, and try to understand them. Sam Ovens:	That's probably the best answer I've had for that question. I think I've done 42 of these. Because, that's so right. A lot of people when they start out, business is about making money for them. But, it's hard to grasp the concept that by forgetting about yourself, and focusing on helping the customer solve their problem, you actually make money for yourself. Do you know what I mean? Oguz Konar:	Mm-hmm (affirmative). Sam Ovens:	The way to really be selfish, is to not be selfish. Do you know what I mean? Because, by doing that, you end up being really rich and successful anyway. Oguz Konar:	Right. Sam Ovens:	Even though, you didn't think about you. But, it makes, it really trips people's mind up, because if you just focus on you, you think, oh, I'm focusing on me, I'm trying to make money for me. But, you end up not making any money for you. Oguz Konar:	You keep losing it on stupid stuff, because once you start making money, then the intention is what we're being taught. It's spending on stuff, the material stuff that's gonna make you happy, but it's not getting you out of that mindset of, let's make more money. It's just feeding that desire to just earn more, earn more, which is of course good. It's evolutionary, we're trying to survive here. But, at the end of the day, it's just by helping others get what they want, and the price doesn't become a problem. When I see it from feedback I get from people, even if they don't sign up, they never say, you're too expensive. It's usually, I cannot afford you. I don't have the money right now. It's not, they bring it back to them. Because, they know that it can't be you. You're just really focused on helping them. It's just, they're not ready for it right now. It changed quite a bit over the years from the strategy sessions that I've done. It will usually be like, "Yeah man, I talk to other guys and they can match your price," or, "I have this guy who can do it for you. That's okay, you can stop today, we'll start with someone else." Eliminating all of those objections, I just want everyone to understand that, it's only happening, because you're in a crowded marketplace. You got to pull yourself out of that, and put yourself in a place that's really not the case, then things will change. Sam Ovens:	Got it. Then, what, you've been in the customer community for years, and you've seen the things other people are going through and experiencing. What would your number one piece of advice be for them? Oguz Konar:	Being revenue focused if definitely good setting up your goals, but before they do anything, I want them to really dig deeper into their customers mindset and understand. That can't just happen by you sitting down and thinking about them. You got to talk to them. If you're just starting out new, if they have a gathering, any type of association gathering, anything like, any opportunity that you can talk to both the high level people, and the people starting out, and ask questions. Don't have the mindset of pitching them your services first. Really listen to them. If possible, record those conversations, they come really, really handy. One of the turning points in our business is, we had a client for about a year and a half, and finally, and we were getting great results for him. Then, I asked him for a video testimonial, he jumped in and we did 25 minutes, a video testimonial. The things that he shared, I did not know about the industry until that time. Although, we were getting great results, I wish I had that interview with him two years ago when he first started. He shared so much stuff. Because, don't forget that there are people in your industry that have been doing the same work for 25 years, and the thing that they would say would just transform your life and your business sometimes. That's just so important part of the process, I believe. If you, before you get too deep into it, just find a way to talk to these people. Sam Ovens:	That's exactly why I do these every day, talking to the customers, because there's not ... I know that some, my team said, "Sam, you should probably give this thing to somebody else. Is this really the best use of your time? You do an hour of this every day," right? I was like, "No, I'm not giving it to someone else until I do 1000." Oguz Konar:	Wow. Sam Ovens:	Because, once I do 1000, then I'll be happy to hand it to someone else. But, it is extremely valuable, because what I learn from these makes the product better. When the product is better, the clients get more results. When the clients results get better, I get better testimonials. When I get more testimonials, I get way more customers. It just, it feeds back on everything. Insights from these create different ads, they create everything. Plus, these videos go and help my customers. It's what, you can never really know enough about your customer. Even when you think you do, there's still way more to go. Those are, that's really good advice, really focus on the customer. You need to be able to see things through their eyes. Do you know what I mean? Oguz Konar:	Thanks for creating this platform and opening it up. Every day, not just from you, but from other people, I try to watch every interview that you do, regardless of where the person is, because it helps us. You learn something, something they say, and it could be adding another $100 thousand revenue on the back end, which you would never find out before. Plugging in with the system is key, right? Instead of going to YouTube or Facebook, and watching random videos, if we build a habit of watching things like this that we're in, in the industry, that also is very transformative. Sam Ovens:	Got it. Then, how can people learn more about you? 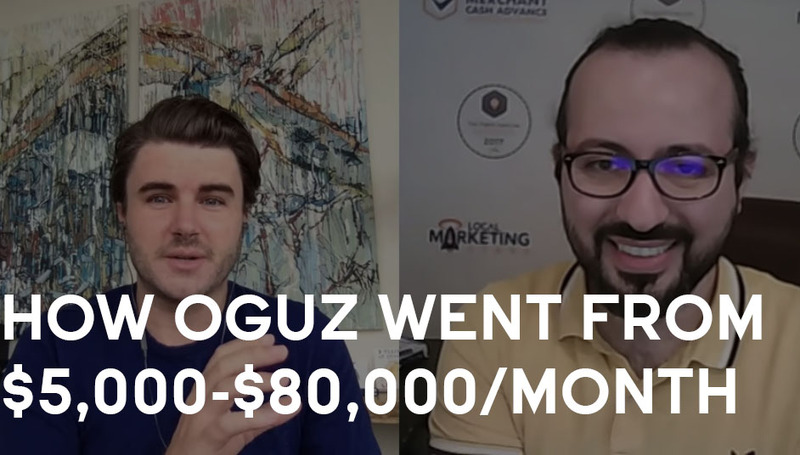 Oguz Konar:	We have one website, it's LocalMarketingStars.com, that's where we have all the information about our funnels, landing pages, and also the webinar for the merchant cash advance companies. Sam Ovens:	LocalMarketingStars.com. Oguz Konar:	Mm-hmm (affirmative). Sam Ovens:	Awesome, well, thanks a lot for jumping on and sharing your story, and I'm looking forward to helping you scale up this program. Oguz Konar:	Same here, thanks for having me, Sam. Appreciate it. Sam Ovens:	Cool, see you. Oguz Konar:	All right, thank you.